Startups, whether bootstrapped or not, usually rely on freelancers and contractors in some form. Whether it’s programming, design, virtual assistance, or something else, it helps when you can hire talent quickly and confidently. That’s why we put together this list of the best freelance marketplaces and freelance websites for you. To help your next freelancer along, you can also share strategies we outline and curate for you in our startup development kits so you’re all on the same page about what needs to get done. In addition, I want to introduce you to two hiring resources that you could find helpful for building your business. Looking to bring your freelancer onboard full-time as a co-founder in your startup? 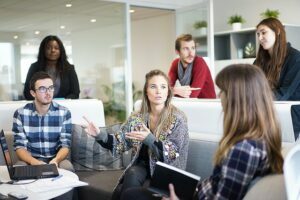 Check out How to Find a Co-Founder and What to Look For to learn in-depth about the ins and outs of getting co-founders. Would you like your freelancer to become part of the team in your startup or business? Learn How to Create a Startup Culture of Excellence where your freelancers can thrive in your workplace. Below, find the best freelance websites to get great talent without having to hire full-time employees. 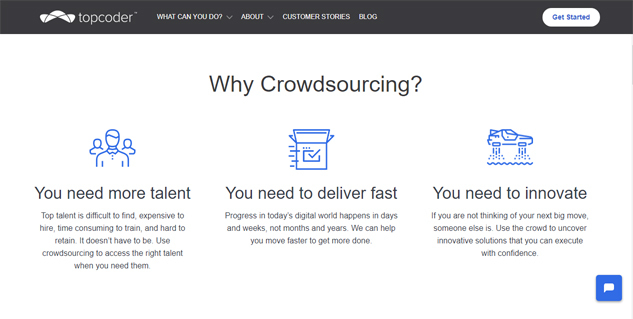 You can use Topcoder to crowdsource your programming projects to only the best developers. Submit projects for design and rapid prototyping, application development, algorithms, and even analytics. When you create a project, you get a crowdsourcing expert called a copilot who is a project manager. Then, the copilot makes sure the Topcoder community delivers for you. Additionally, the copilot clarifies your idea, then creates your game plan by breaking the project down into a series of small challenges for each phase of your project. Programmers complete your challenges when the requirements are dispersed throughout the community. Only hyper-specialized, highly qualified developers can sign up. Moreover, depending on the type of project you submit, you select what you feel is the best submission or a Topcoder expert reviews and scores each submission and the one that ranks highest wins your business. Gun is a marketplace for you to find and hire quality freelance software developers. You select developers from a community of over 25,000 freelance programmers. Don’t worry about resumes because Gun thoroughly vets ever every freelancer in its invite-only community. Project managers handle every freelance engagement at no cost to you. Additionally, Gun backs every piece of work with their $100,000 money-back guarantee. Gigster combines top developers and designers with artificial intelligence. Developers are selected for projects using 20+ criteria so they deliver a world-class finished product, every time. When you start a project, a project manager from Gigster assembles a team of their own to spearhead your project. 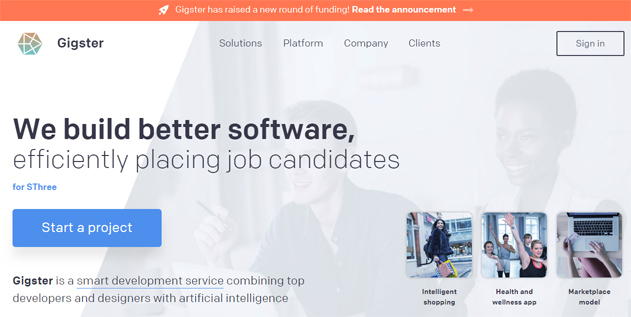 Moreover, the artificial intelligence that Gigster uses enables their project managers to predict setbacks in advance and change course if need be. Since they rethink every project step to streamline for speed, project managers build specs 80% faster than average. What’s more, developers can start with up to 60% of the code already written. This means developers start and finish projects faster. 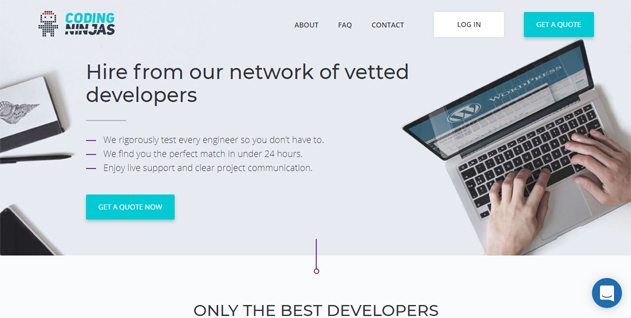 Coding Ninjas has a network of vetted developers for you to hire from. They hire approximately 4% of their applicants. Coding Ninjas helps you find the perfect match in less than 24 hours and they rigorously test every engineer so you don’t have to. Moreover, every developer of theirs has to pass their live interviews, pass their English test, and pass their code quality test. Before you start a project, you submit your requirements to get a price quote. Then you can decide whether you want to pay per hour or choose one of their plans. They have three plans: Hourly at $39/hr, a fixed price (from your quote), or monthly subscription packages starting at $23/hour (you can cancel anytime). Hire top talent from Toptal’s network of freelance software developers, designers, and financial experts. They have a rigorous screening process and they hire only 3% of the applications they receive. Moreover, their screening process includes 1) language and personality screening, 2) in-depth skill review, 3) live screening, 4) test projects, 5) continued excellence where freelancers are expected to maintain a perfect track record when working with clients. Codeable is a great outsourcing service for WordPress and provides you access to carefully chosen developers who can provide on-demand website support, based within the US and Europe. They have selected 300+ skilled WordPress experts who have completed an extensive testing process. They also have excellent customer service, which provides prompt responses, and is available 24/7. Additionally, Codeable provides a money back guarantee, so it’s 100% risk free. 99 Designs is the destination for talented freelance designers. When you use 99 Designs, you’ll get a design you love or your money back. You designate the quality of the designer you’d like to hire. They offer bronze, silver, gold, and platinum packages from least expensive to most expensive, respectively. Then, designers from the category you choose will compete for your business by submitting to you their designs for your project requirements. If they hit the mark and make something you love immediately, then that’s great. However, If they don’t, then you can submit feedback and they’ll make edits to match what you suggest. After 7 days of submissions, you pick your favorite design and you pay only the person who designed it. Dribbble provides one of the largest global sources for finding high-quality designers. Dribbble also had bought out Crew’s business, which hired top-notch creative freelancers, software developers, and small agencies. It is a popular destination for millions of designers and businesses every month. 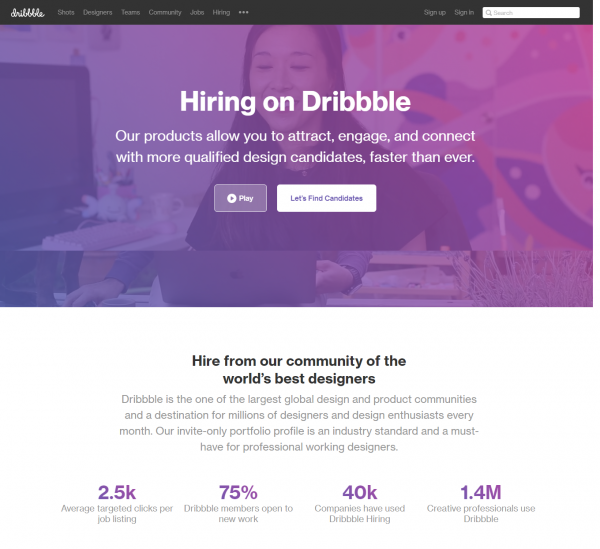 40,000 companies have used Dribbble’s hiring services and over 1.4 million creative professionals have used Dribbble. Dribbble’s hiring solutions make it easy for you to find and hire amazing design talent. With plans for every size team, Dribbble gives you the tools, knowledge, and support you need. Dribbble completes the screening, vetting, matching, and pre-interviewing process for you. On their website you can find and contact designers, or post on their job board to hire high-quality creative professionals. UpWork is one of the best marketplaces for you to find anywhere between beginner and expert freelancers from almost anywhere in the world. 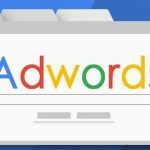 You can hire people for just about anything there and UpWork’s system is pretty easy to use. Post jobs for free and select your favorite freelancer from their job applications. 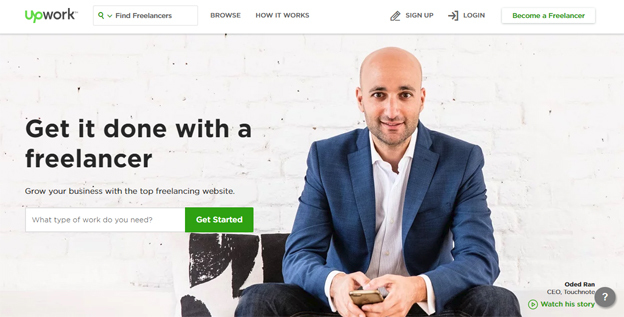 Additionally, you can invite people to apply for your job and UpWork has lots of criteria you can select from to narrow down your job requirements and get the right freelancer for your business. 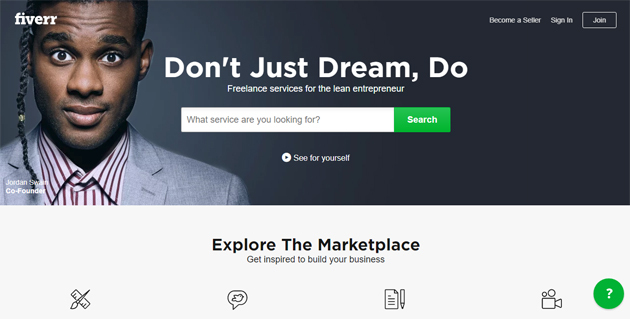 Find a freelancer for almost anything you will need in your startup at People Per Hour’s marketplace. You can hire freelancers that do jobs at fixed prices or hourly. All freelancers are rated from feedback provided by clients. What’s more, you can even find freelancers with popular fixed-price jobs. Guru is a huge marketplace where you can find and hire talented freelancers for almost any task. They boast a base of 1.5 million freelancers and you can browse their previous work so you’re hiring with confidence. You can create agreements, define milestones and tasks, communicate, and share documents without ever leaving Guru.com. Moreover, their work is guaranteed. You only pay at the end of the project if you’re satisfied with the work. Hire a freelancer in one of three ways: 1) post a project, 2) post a contest, 3) post a local job. Only pay after the job is complete. Live chat with freelancers to get updates on the progress of your posted job. Find anyone from novice to pro. You can see freelancers’ ratings on a 5-star scale, the amount of reviews they have, their hourly rate, and read their reviews. Additionally, you can set your project as a fixed project cost or an hourly project. Truelancer allows you to post projects, run contests (for logos, mobile app designs, and website mockups), or buy a la carte services. When you post projects, you can get free quotes and compare your options. Additionally, they have a 100% money-back guarantee and once you’re satisfied, you release your payment. Another service they have is their “prime service.” This service gets you talent sourcing and dedicated support throughout the way, a project manager, and you can access handpicked, top-rated freelancers from their curated pool of talent. Fiverr is a great marketplace for hiring freelancers for small, inexpensive jobs. Its name is indicative of the project-cost, where projects will start at $5 USD. However, don’t expect to hire top-notch freelancers from this website. And last but not least, we have Freeeup. FreeeUp helps businesses find quality freelancers and helps quality freelancers find great work. They have helped thousands of businesses all over the world who are looking to save time and money within the hiring process. FreeeUp recruits, interviews, and vets thousands of freelancers every month, and then gives you access to the top 1% of applicants. You can get introduced to a freelancer from the marketplace matching your needs within 1 business day. 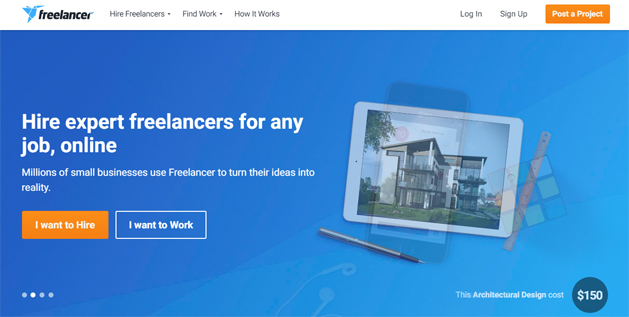 While there are quite a few more freelance websites, the 15 above give you a good snapshot of where you can find freelancers to do the work you need them to do. 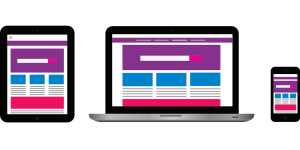 Try using the specialty websites for anything specific you have in mind first — or at least check them out. As with any project you get done, it’s important to get multiple quotes from people to ensure that you’re not only getting a fair price, but that you are getting quality services from them. 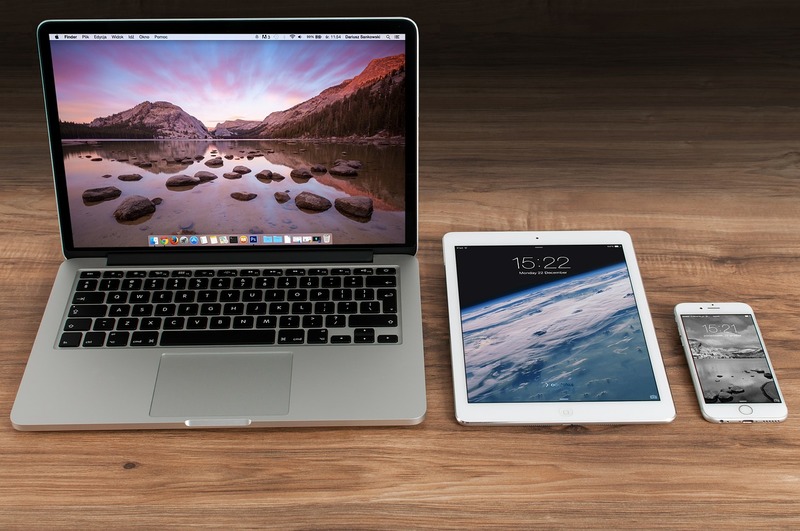 Which of these freelance websites have you found to be the best for you? Are there other freelance websites which you’ve used and found to be really great to use? Although I angel invest full-time now, I am a pretty scrappy engineer at heart and love to hire remote engineers and manage them on my own when I work on personal projects. I have one “project” that’s turning into a startup and I’ve tried many of these remote engineering firms for it — Toptal, Crew, Andela, Upwork, Remote.com, Hubstaff Talent etc. The other answers here are absolutely correct that Toptal and Andela are in their own league compared to Upwork and Freelancer.com. The latter have no filter, and yes you will waste your time hiring people from there because while some quality candidates do exist, they are a needle in the haystack and in all likelihood you won’t meet them. When I hired from Toptal, I knew I had to put down at least 80/hr to hire a good candidate which I was prepared to do. I got a fairly decent engineer from Eastern Europe who was very good at React and Django, the technologies I was hiring for. He helped me build the dashboard for the telemedicine platform I am working on (still not yet launched), and I was impressed by his responsiveness. The experience was way better than wasting my time with Upwork. But as any entrepreneur, I am always trying to get the best bang for buck and also am always trying to attract as much high quality remote talent to my company as possible so I started researching Toptal competitors. I came across Crew and Andela but they seemed no different from Toptal. I later came across this fairly small company started by this Stanford grad I met at a networking event in Mountain View. At first I was hesitant, but the company Learning Dollars gave me 10 hours of free engineering. I thought it was a bit too good to be true that I don’t have to put down money before hiring an engineer, but it turned out to be legit. I got to try out a couple engineers and saw how they gel with my style and needs before I made any commitments — one of the two engineers I worked with gelled. I got matched with a pretty good Django dev and he currently works with our Toptal dev — they are together pushing out a new version of our dashboard based on customer feedback every week. Learning Dollars is charging me 35 per hour for the developer, and Toptal 80 per hour. Both are good and I’m keeping both of them right now. I think Toptal is great because of its vetting process which Upwork, Freelancer, and some of these traditional market places lack. 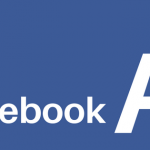 They’re a pretty revolutionary company in this space for that reason. That being said, there are some interesting companies starting to compete with Toptal and offering free trials, and they have similar vetting processes in my opinion, so I would try those options out as well, especially if you don’t have to put much down. Thanks for sharing your thoughts and experiences using these freelance websites, Ronald! You could add CodeMentor X and Adeva on the list too. They are both great resources for hiring top tech talent. Thank you for your suggestions, Denica! What’s your experience using either or both CodeMentor X and Adeva?